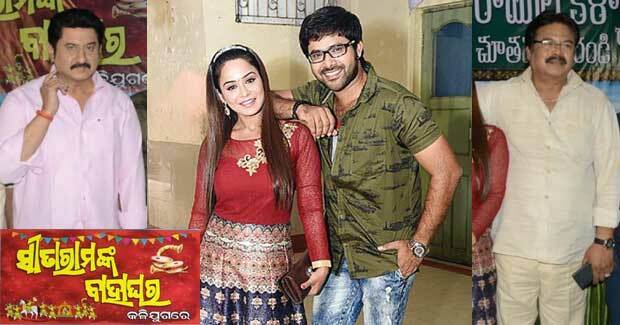 Sita Rama nka Bahaghara (Kali Jugare) is the new Odia movie of Sabyasachi Mishra which will also release in Telugu. Suman Talwar, the Telugu actor who had played the negative character in the Akshay Kumar starrer Hindi film ‘Gabbar is Back’ is in Odisha to shoot for this bilingual movie that casts Manisha Chatterjee, Bijay Mohanty, Anita Das and Papu Pom Pom. This movie will be in two languages including Odia. While the Telugu version will be released in Andhra Pradesh and Telengana and other parts, the Odia version will be released in Odisha. The name of the movie has been declared yesterday in a press conference in Bhubaneswar. “This is a great experience to work with such a legendary actor. He is popular in South and his recent role in Gabbar is Back has popularised him across every household in India. His stay in the shooting set will be a great inspiration for us,” said Sabyasachi. Sitaramula Kalyanam Chuthamu Raarandi is title of the Telugu version. This film is Sabyasachi’s second Telugu movie after Neerajanam that is yet to be released. “We all love the tale of Lord Rama and Devi Sita, which was epic. Their love was so eternal that Sita also went for 14 long years with Ram during their ‘Banabasa’. Till date we visualize that pair as the best ever possible couple. Have you imagined how Ram and Sita will be if they were born in Kali Yuga? This is our story all about. How their marriage is happening and how a marriage plan is bringing twist and turns,” Sabyasachi disclosed story of Sita Rama nka Bahaghara odia film.